I’m just back from a trip to Washington, D.C., where I was participating in the National Writing Project’s final meeting relating to the Building New Pathways to Leadership initiative. We had a great chance to share and begin to disseminate the resources generated over this two-and-a-half-year deep dive into the NWP’s past, present, and future. This website (Write/Learn/Lead), which is a curation of NWP resources that help teachers lead within and beyond the organization. The knowledge base section is a pile of really useful stuff, from theoretical to extremely practical. And it continues to get fiddled with, so the collection will continue to improve. My job as co-leader of the badging team was to help this very large network ask itself some very hard questions about what it means to be a teacher leader, and what it means to do our work of professional development with and for teachers. It’s been incredible work—because in many ways I basically got to be a petulant two-year-old asking the NWP “Why? Why? Why?” Why do we do this entry experience this way? Why does it look like this? Why is the audience for this thing those people? You get the idea. I want to write more about each of the social practices, but I wanted to end this post with an idea that, ahem, emerged in the work that I wasn’t counting on. While we were aiming at helping our design teams and the larger network identify how they should think about new pathways to leadership, new opportunities to engage teachers in useful ways, it turns out the social practices framework is also quite useful as a program review tool for some of our older and previously designed pathways, too. It’s obvious in hindsight. But worth saying out loud writing down. This process was a reminder that you get better at being you by constantly re-looking at yourself through the lenses of what you value, and I’m so glad I had the chance to participate in this work. It challenged me to reevaluate things I and others I respect take for granted, and that’s hard to do but well worth doing. I’m also tremendously excited to see what local Writing Project sites will do with these resources, and what new pathways they will build. Oh—if you haven’t found your own local Writing Project site yet, well, it’s time. That’s how Elyse describes it. And since she’s the Executive Director of NWP, I think she’s the right person to do the describing. They just released highly detailed reports of their experiments and how things worked—or didn’t. You didn’t know you wanted to read these—but you really do. 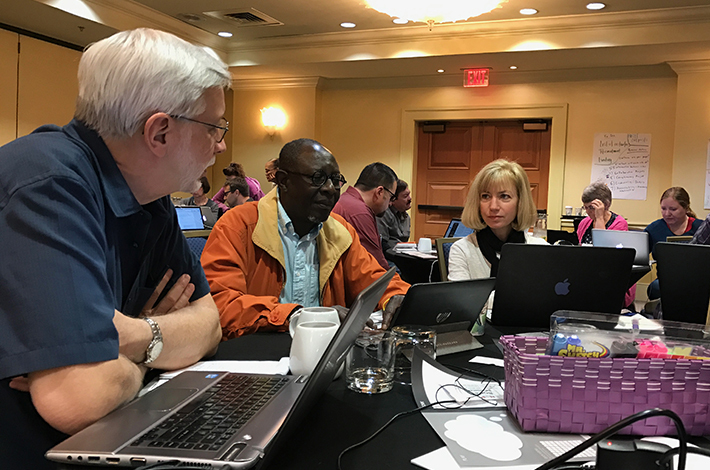 If you’re not familiar with NWP and its more traditional model, the typical initiation into the network has occurred through a several-week-long invitational summer institute. Think of it as a summer camp. 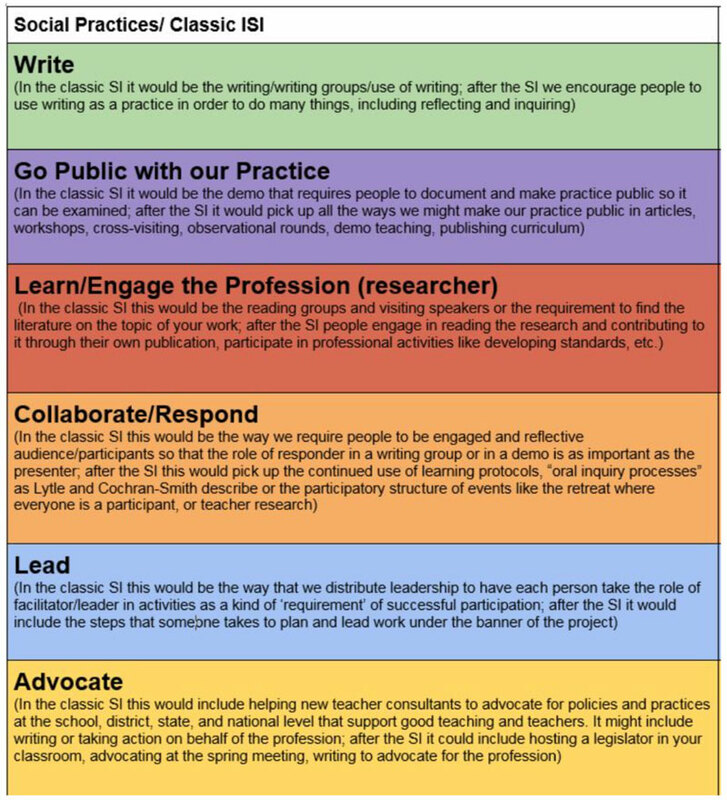 Where you write with, share practice with, and inquiry together, some really smart teachers who may or may not teach like you do. That’s commonly abbreviated as the ISI or the SI—hence the “in the classic SI” descriptors here. The group is still working on more resources to share the framework beyond the network. Stay tuned.